Turkey wings were a surprise in my kitchen! 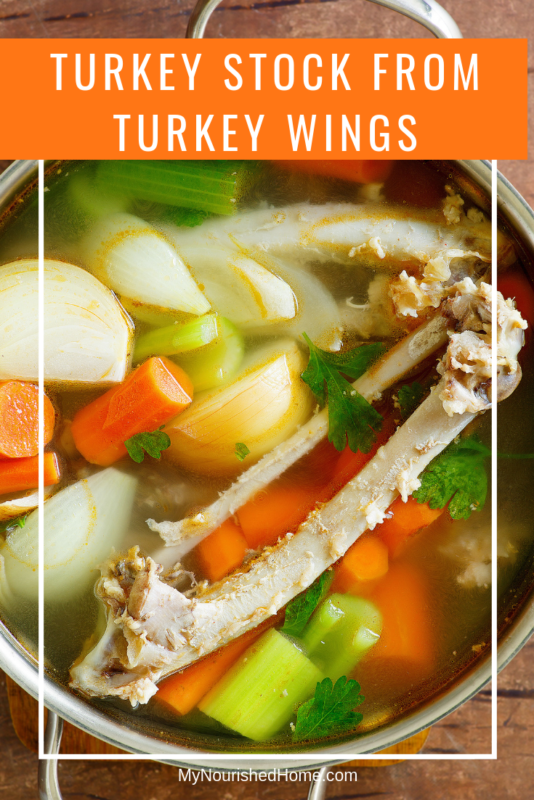 I was making wings for turkey stock and enjoyed them so much they became a recipe we look forward to every year! These are also baked (there is a trick to getting them crispy in the recipe!) so no splattered greasy mess to deal with… And just a bit healthier than their fried alternative. Pat your turkey wings dry, brush them with olive oil, then season them with poultry seasoning and kosher salt and pepper. Place your turkey wings in a casserole dish. The wings are going to release their juices so you want them in a pan with sides so the juice doesn’t run over! Cover them in foil and place in the oven. Remove the turkey wings from the oven, raise the oven temperature to 425 degrees, remove the foil and put them back in the oven for an additional 30 minutes. When you remove them from the oven, you should have nice, crispy wings! Dress them just like you would chicken wings! Toss them in your favorite sauce with carrots and celery or eat them just like they are right out of the oven. I can’t decide if the Turkey Wings or the Turkey Stock are the most important part of this 2-for-1 recipe. Turkey wings are fabulous, crunchy, meaty bits of wonder. But the turkey stock is going to make your holiday cooking so much easier! No waiting for the turkey to cook when you need broth for other recipes – because that just makes for cold holiday Turkey and who wants that! And no store-bought broth when you really need the richest, best-tasting broth because everyone you love is around your table. The good news is that the turkey wing recipe is super easy and the turkey broth literally cooks itself in the slow cooker. 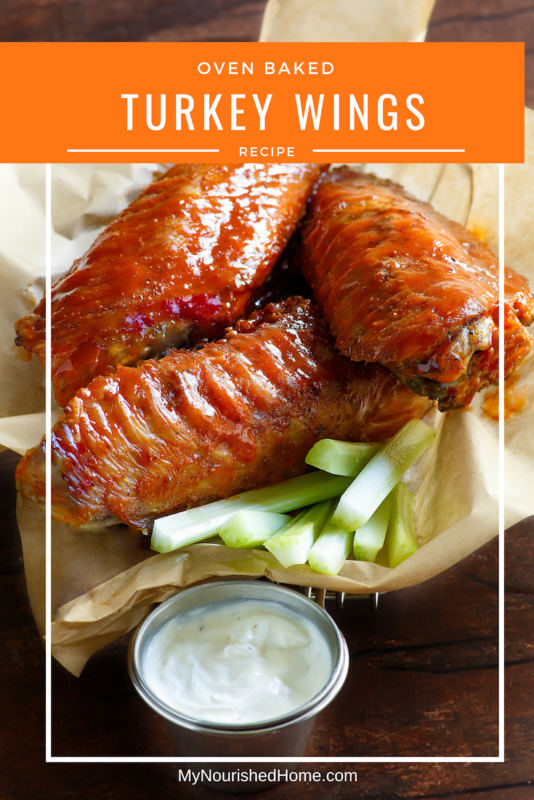 We like these turkey wings right out of the oven, tossed in Roasted Pepper Wing Sauce – or sprinkled with what we Southerners call pepper sauce. It is not hot sauce, though it is hot and it is a sauce. Basically, it is the hottest peppers you can find (like so hot they would make you cry), halved with the seeds left in, a little salt for pickling, some whole peppercorns – and time for the peppers to flavor the vinegar. Sprinkle the hot vinegar over anything you would like to be hotter. Be careful if you have never done this… just sayin’. When you are done licking your fingers from the turkey wings. 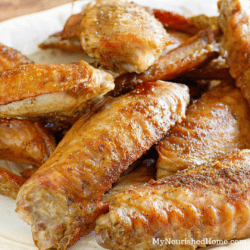 Dump pan drippings, leftover bones, and wing stuff into a slow cooker. Add 2-3 carrots chopped into a few pieces, a quartered onion, a handful of parsley, a piece of celery, or any combination of veggie drawer paraphernalia that could possibly go into turkey stock. Fill it with water, cover and turn the crockpot on and go to bed. Be prepared to wake up in the night starving… <— it smells so good! This recipe calls for poultry seasoning. If this is not something you keep handy in your spice drawer, it is easy to make yourself. Here is a quick recipe! 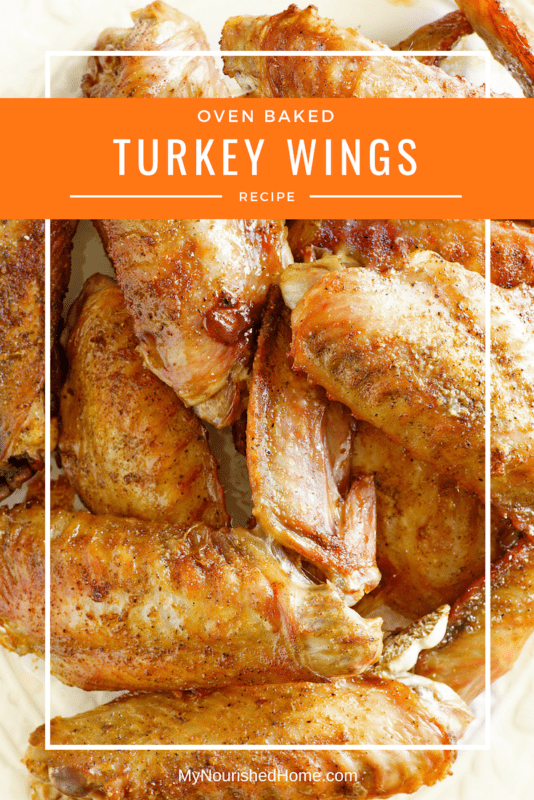 These turkey wings are baked, not fried. But super crispy and rich tasting. Then use the leftovers to make the best turkey stock ever... perfect for homemade soup or freeze it ahead for holiday cooking. Place turkey wings in a large casserole dish or on a baking sheet, keeping in mind that the turkey will release its juices and you don't want them to run over - so it should be a pan with sides! Brush both sides of the wings with olive oil. Sprinkle with poultry seasoning, salt and pepper. Cover wings with foil and place them in the oven for 30 minutes. Remove wings from the oven, raise the temperature of the oven to 425, remove the foil and put them back in the oven for an additional 30 minutes. This should give you nice crispy wings! 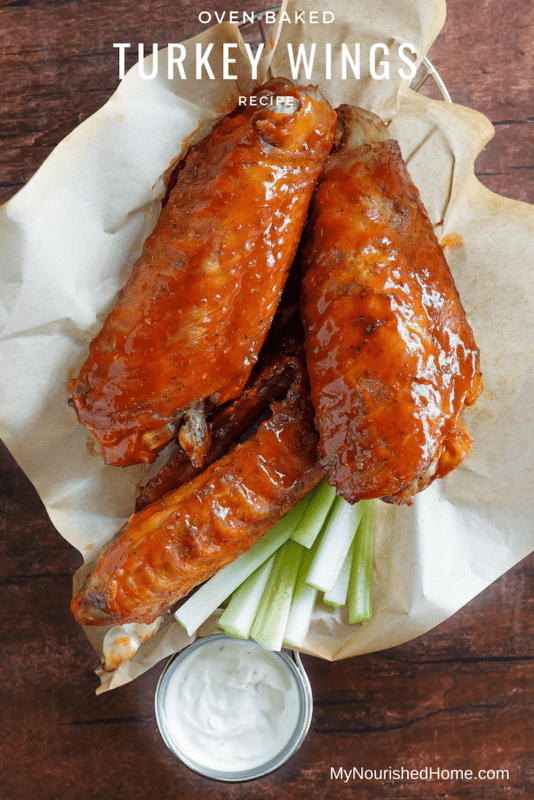 Treat these just like you would chicken wings. Toss them in wing sauce, hot sauce, whatever you like. But these are also delicious right out of the oven!! MAKE TURKEY STOCK with the leftover bones and pan drippings! 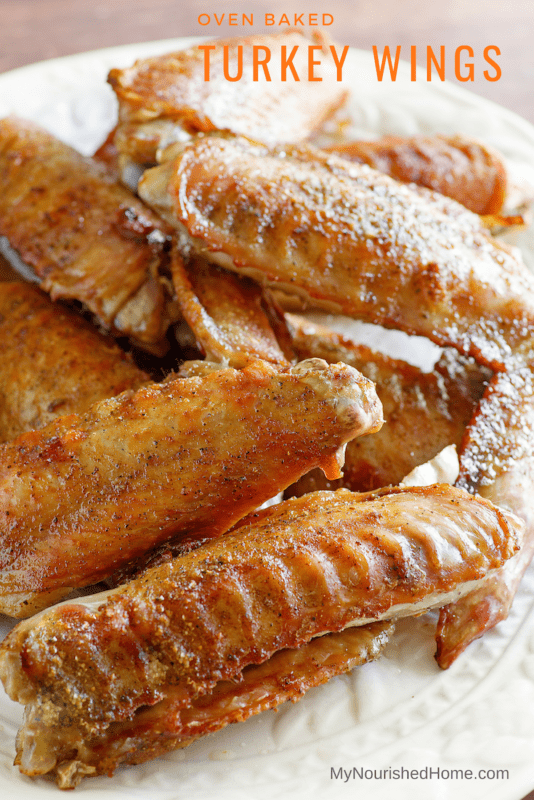 Dump pan drippings, leftover bones, and wing stuff into a slow cooker. Add 2-3 carrots chopped into a few pieces, a quartered onion, a handful of parsley, a piece of celery, or any combination of veggie drawer paraphernalia that could possibly go into turkey stock. (This is an excellent way to clear out the vegetable drawer! I have been known to use carrot tops!) Fill the slow cooker to the top with water, set it on low and let it cook all night. The next morning, turn off the slow cooker and let it cool until you can handle the stock without getting burned. Use a kitchen spider (or a slotted spoon) to remove the large pieces of turkey bones and vegetables. Place a strainer or cheese cloth over the top of your Ball or Mason jar and ladle stock into clean jars. The strainer will remove any leftover bits that you don't want in your stock. Put the lids on the jars and place them in the fridge or the freezer. The amount of stock you end up with will depend on the size of your slow cooker. I have a gigantic one and put away more than 3 quarts of the most flavorful turkey stock, made from things that I would have otherwise put in the trash. Bring on holiday cooking!! I am ready! Previous Post: « But What if I Make a Mistake?